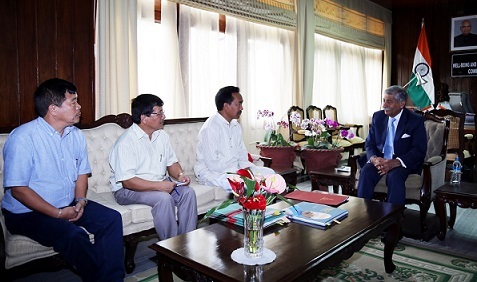 Arunachal Pradesh Education Minister Honchun Ngandam called on the State’s Governor BD Mishra at the Raj Bhavan, Itanagar on Saturday. They had discussion on issues related to improvement in the education sector of the State particularly in elementary and secondary level and ways to boost education. The Arunachal Pradesh Governor, who has been emphasizing on making textbooks available for the students, directed that textbooks must reach the students with the commencement of the academic session itself. He said that utmost care must be taken for timely transportation, storage in the districts and delivery of the books without any damage. Mishra also stressed that there must be proper monitoring from the directorate and the deputy directors of education in the districts must take personal interests in the process. The principals and headmasters must be sensitized for prompt collection and distribution of the books, he said. Sharing his observations during his tour to all the twenty-two districts in the State and interaction with the students and education officials, the Governor emphasized on teachers’ attendance and rationalization of teachers’ posting throughout the State. He also highlighted on opening of National Cadet Corps (NCC) units in the school, construction of a world class Sainik School and special effort for the education of the children from the Puroik community. Earlier, the State Education Minister briefed the State Governor on status of textbook procurement and distribution plans. The Minister also informed him of the ensuing recruitment of 127 postgraduate teachers and 544 trained graduate teachers. The Minister requested the Governor to put in a word with the Arunachal Pradesh Public Service Commission for expediting the process for early posting of the teachers. As a follow-up of the meeting, the Governor later had a meeting with the chairman, Arunachal Pradesh State Public Service Commission, Tajom Talo and requested him to expedite the process of teachers’ recruitment and posting. The State Education Minister was accompanied by the director, Secondary Education, Gania Leij, joint director, Secondary Education, Marken Kadu, deputy director, Secondary Education, Bango Palon and officials dealing with textbooks.